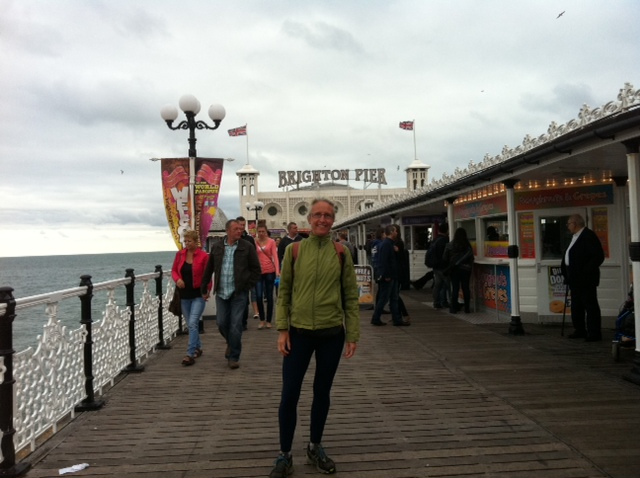 The London to Brighton is a 56 mile largely off-road race and the main focus of my training this year. Three and a half weeks to race day and we finally got our map books in the post. I’d heard this is what normally happens, so had put out email tentacles and was sent a write-up by a friend of a friend who did the race in 2010. Because he’d seen nobody between 25 and 40 miles, and also my experience of getting lost in the Long Eaton race, I thought I’d better recce! Our youngest child going to Guide camp offered a perfect opportunity a fortnight before the race, so I booked my train tickets, planning to walk the whole thing over 3 days. Even tho the 1:25000 OS maps in the route book looked nice and clear, I didn’t want to leave anything to chance. In London, I caught the DLR to Lewisham, nearest station to the Start. This is in a TA Centre and I got quizzed by the security man as to why I’d taken a photo of the sign on the gate! The streets of Lewisham, Catford and then Bromley are quite fiddly and it’s easy to make what orienteers call a ‘parallel error’ where you mistake one junction for another and everything goes pear-shaped! The route followed a couple of urban nature reserves alongside the Ravensbourne and PoolRivers. 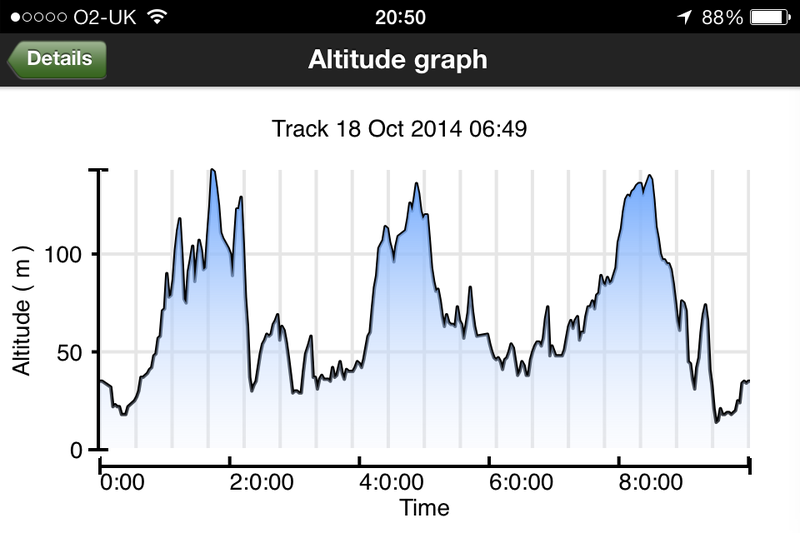 It would still be dark while running this section on race day so it was a good confidence boost! After Catford Station there was an unlikely looking exit from a retail park and I annotated my book ‘Go past Halfords and Wickes’. Then at Bell Green I somehow ended up marshalling traffic as a lorry had to reverse to avoid a low railway bridge! I had my packed lunch at Beckenham Place Golf Club where I saw a fox and several squirrels. After Bromley and Hayes you get to Keston where I had a coffee in the pub and found the location of Checkpoint 1 at 10 miles. My friend-of-a-friend’s write-up said that the 300 year-old Wilberforce seat is here where William Wilberforce proposed to William Pitt that they should introduce a bill to abolish slavery, so I kept an eye open for it. Later I showed my map book to some walkers who told me the location but it was off the 2012 route so I never saw it! I got quite lost in some orchards shortly after and had to get my i-phone out to navigate, eventually finding the route again but backtracking so I could annotate my book. The mistake cost me 30 mins but better now than race day! After this there was a climb up to Biggin Hill where the route emerged for 400m onto the A233 at the Air Base. I was lucky to get a look round the very moving RAF Chapel which closed at 4pm. The next page of map takes you to Tatsfield where there’s a Post Office and store. It’s handy to know where there are shops just in case you need extra food or water (a £10 note is much lighter than a bottle of water you may not need)! I had to detour here round some private land that was only crossable on race day, then it was over the M25 just west of Clacket Wood Services. I’d earmarked the pub at Limpsfield Chart as the place to knock off for the day and call a taxi and got there at 6:30 after 8 hours of walking and 18 miles into the route. Having stayed at a friend’s house in Caterham, the same taxi picked me up at 8am and dropped me back at Limpsfield Chart. There was a nice descent of the North Downs here and I soon reached Checkpoint 2 on a minor road where spectators were not allowed on race day. Edenbridge Golf Course was tricky to navigate so I put more biro on my map and searched for somewhere to have coffee. Didn’t find anywhere until Ashurst Wood at 2pm but the Three Crowns was worth the wait. A sign told me that when it opened in 1743 the rent was 12p a year, now it’s 12p a minute! There was a nice section past Weir Wood Reservoir but this day was 10 hours and it was still two and a half pages until I could knock off. Had another coffee in a pub at Horsted Keynes, location of Checkpoint 4 and generally pretty village. I was getting quite tired of the constant faff of navigating and today was a bit boring compared with the excitement of London yesterday. Got to the Sloop Inn at Freshfield Bridges just after 6 and borrowed the pub phone as I had no signal. Took my pint outside to wait for the taxi to my B&B. I’d completed 25 miles in 10 hours and was now 43 miles into the race! Yet another taxi brought me back for the last leg which started with a 3 sides of a square detour but at least it went past a nice campsite with some toilets. Chailey Common was very pretty and I could hear the tannoy from Plumpton Race Course for several miles. It was here near Checkpoint 5 (again no spectator access) that I got the first welcome views of Black Cap where the route crosses the South Downs. The classic road race crossed the Downs via Ditchling Beacon, 3 miles to the west but hasn’t been run since 2005. 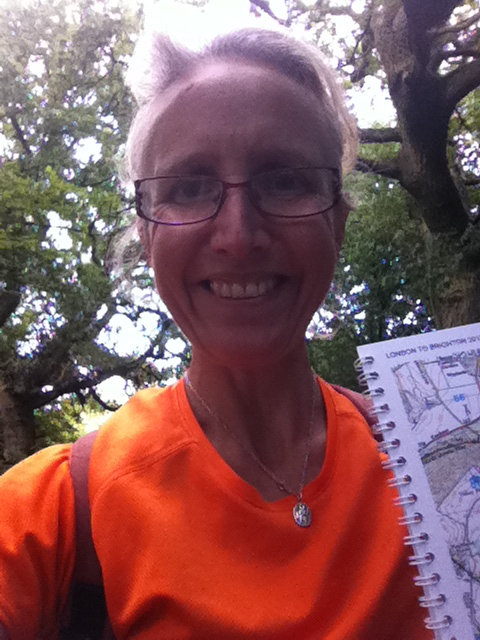 Here I saw another pair of runners with the telltale A5 spiral-bound route book and we had a quick chat and wished each other good luck for on the day. I thought I wouldn’t see him on the big day but I did! There was a large ploughed field crossable only on race day to go round, then it was up Black Cap which was great after the monotony of the middle third of the route. It got cold though as you picked up the breeze from the Channel. There’s some straightforward easy running past Falmer and Woodingdean and then the stunning descent into Brighton crossing the hill-top racecourse and following a big spur to East Brighton Golf Club. Then its just 400m to the beach and the Finish at Blackcap Volks Railway Station. The last 16 miles had taken 6 hours bringing the total walking time to 24 hours, minus an hour over the 3 days for food stops and probably 2 hours for navigational errors = 21 hours. As a result of the recce I upped my 11hr schedule to 12hrs and wished it was 10 years ago and I’d entered the road race! Never mind – I felt confident of not getting majorly lost on the day as I fought the seagulls off my well-earned fish and chips at a beach-side café. I found out about this race when innocently reading someone’s blog and thought it would be a good try-out for the London to Brighton race which I’ve wanted to do for a few years now. That race is hilly and has aggressive time-outs whereas this one is literally along 2 canal tow-paths for all but a mile of its 56! It’s also £50 cheaper to enter!!! 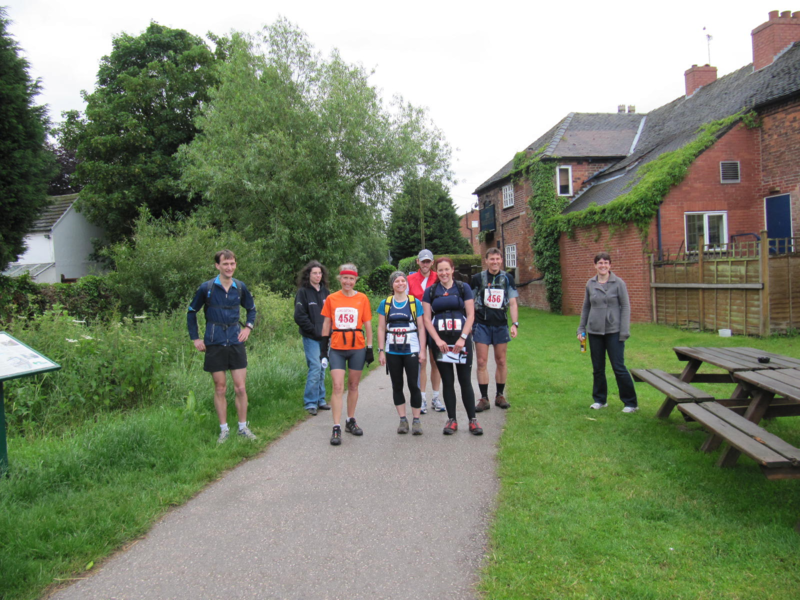 The race is in April and my training was getting ready for the Wilmot Wander round Derby which is 32 miles and very hilly – very muddy too as it’s always in January! 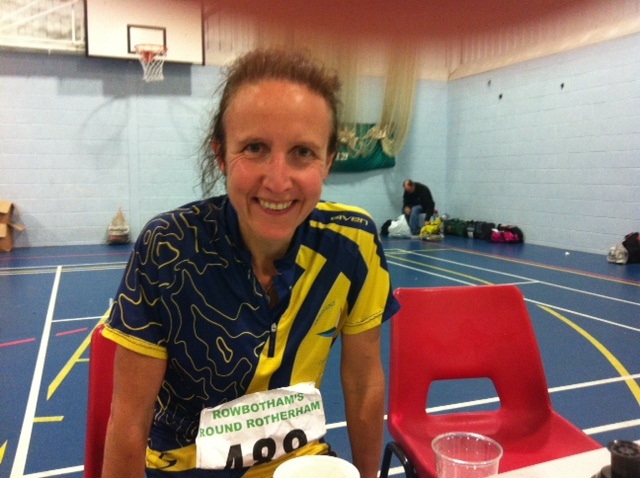 I did the race in 6 h 15 and did it again in training 3 weeks later, managing to count 80 stiles along the route. Well, I thought, if its half a minute lost per stile, I could do that 40 mins faster! Husband Dave, daughter Sarah and I went up to Glasgow by train and got a good deal at the Hilton which we managed to seriously negate by having a blow-out 3-course room-service meal. The race started at 9am at RuchilPark in Glasgow and we dropped off a bag each for Checkpoint 2 and another one for Edinburgh. The route followed a branch of the canal north for a mile before joining the main Forth-Clyde Canal. The instruction was to turn right here otherwise we would end up at Clydebank on the west coast! Everyone must have been saving themselves as I was 2nd for the first 2 miles of the race, and about 10th by the first checkpoint at Auchinstarry. This was 13 miles in and I got there in 2 hours, refilled my water bottle and had a Bakewell tart from Dave and Sarah who’d got there by train. 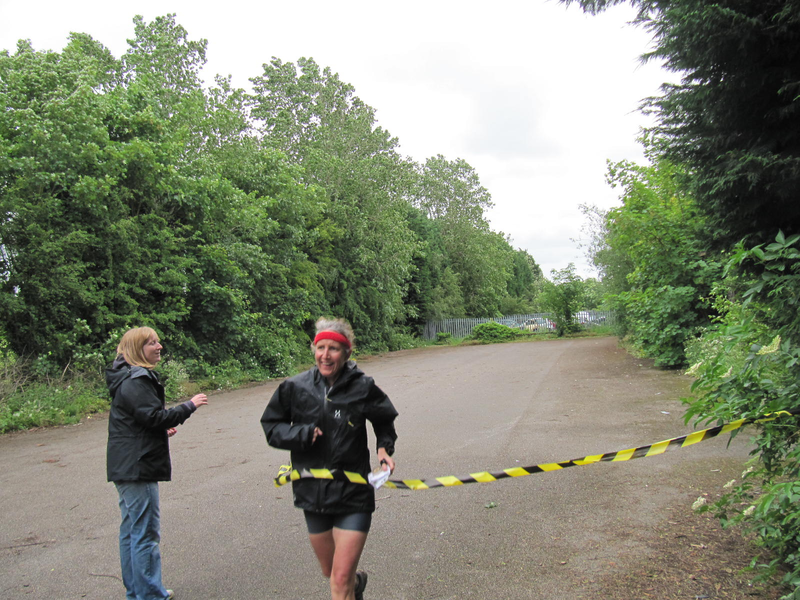 From then on, they managed to get lifts from 2 different runners’ wives – probably because Dave was sporting some handy OS maps and Sarah – aged 9 – looked fed up! The route was very pretty, there are lots of Roman ruins and alleged bits of the Antonine Wall and there’s been some millennial regeneration of the canals, which had slipped out of use since the 1930s. 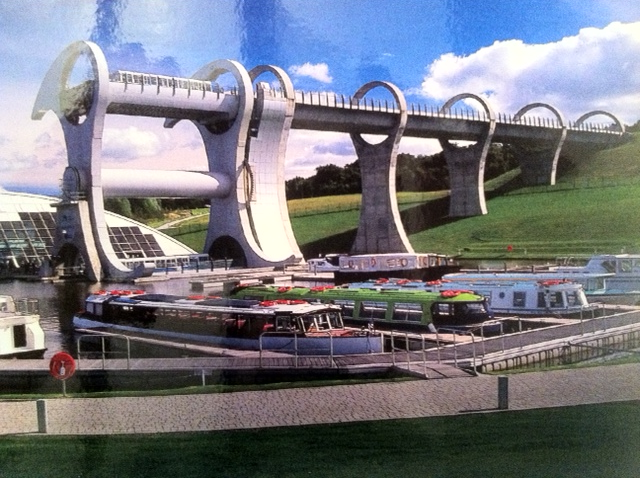 The main focus of this was the opening in 2002 of the Falkirk Wheel which lifts canal boats 40 metres from the Forth-ClydeCanal to the UnionCanal – but only when there’s a boat coming in the other direction to counterbalance it! The Falkirk Wheel at 22 miles – the world’s only rotating boat lift, replaces a series of 11 locks and the only climb in the whole 56 miles! The second checkpoint was at the Wheel, 22 miles into the race, and I got there at about 12:30. There was a nice atmosphere there and some of the visitor centre crowds had come to spectate while runners’ partners enjoyed a bit of tourism! 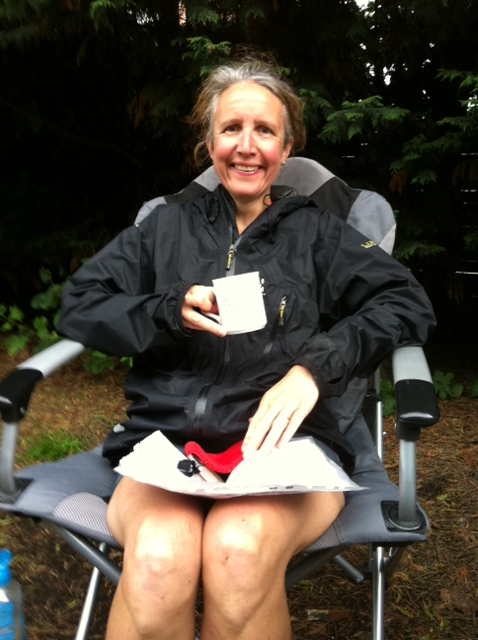 From here on I carried a bladder as it was getting hot and we were well into the race. We had to detour from the canal here as a tunnel was in need of repair so there was a marked route up through Falkirk for a mile. The next leg to Linlithgow was 11.5 miles and was the low point of the race as the end wasn’t yet in sight but I kept telling myself I could walk after Checkpoint 3. I got there at 14:50, ate and refilled my bladder. The next section to Broxburn was 8 miles and the canal did a big S bend so I could expose my left side to the sun for the first time in the day! I got a bit of a second wind but was still moving slowly, needing to walk some bits. At Broxburn, the next leg was only 5 miles and everyone was doing it without rucksack so that was a nice bit of relief. We met our friend Chris here with her car so they were able to intercept me at other points and Chris and Sarah would wave from bridges while Dave ran with me. He did all of the last 9 miles from Checkpoint 5 at Ratho to Edinburgh Quay. It was interesting to see how the canal crossed the M8 via an aquaduct and gradually the route got more urban as we ran into Edinburgh. Parts of the UnionCanal had been filled in when it fell into disuse in the 1930s but since 19?? It had been restored to its 18?? Glory. The last 9 miles took me 2 hours and I finished in 11 hours 3 minutes, coming 46th out of 64 and 8th woman. It would be interesting to see if going slower on the first bit would make for a faster overall time – but I think you should always go for it while feeling fresh! Perhaps I’m too impatient for ultra distance running! POST-SCRIPT: This race was much better for a beginner than the London to Brighton – 5 miles shorter, no climb (literally) and canal tow-path all the way – as the organisers say, ‘If the canal’s not on your right then you’re lost!’ Because you run from west to east all day (and the canal is always south), the right half of your body comes back sun-burnt! !